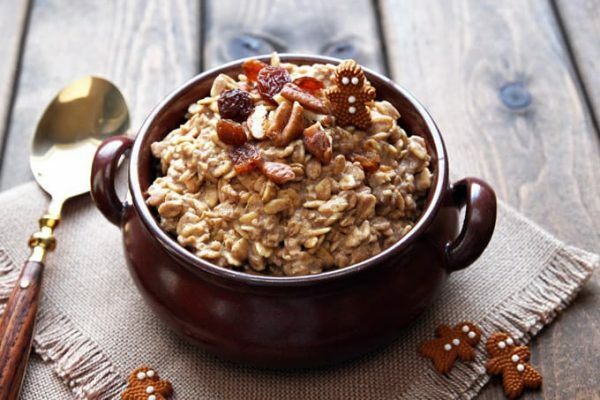 This Overnight Gingerbread Oatmeal is a healthy and filling make-ahead breakfast option flavored with gingerbread spices and molasses. Ready or not, Christmas is almost here! We are actually all done with our family and work get-togethers. We celebrated with my family a couple weekends ago when we were visiting in Kelowna. And with Konrad’s family we had turkey dinner on Monday night. Tick those off the list! It was certainly fun touting around Olivia, to be sure. Actual Christmas Day will be quieter around here. It’s the first Christmas we celebrate as our own new family of three. This will give us a chance to start forming our own Holiday traditions. With a capital “H”. Speaking of Christmas traditions, I know that sweet rolls – especially cinnamon buns – are a standard breakfast item for many North American families on Christmas morning. 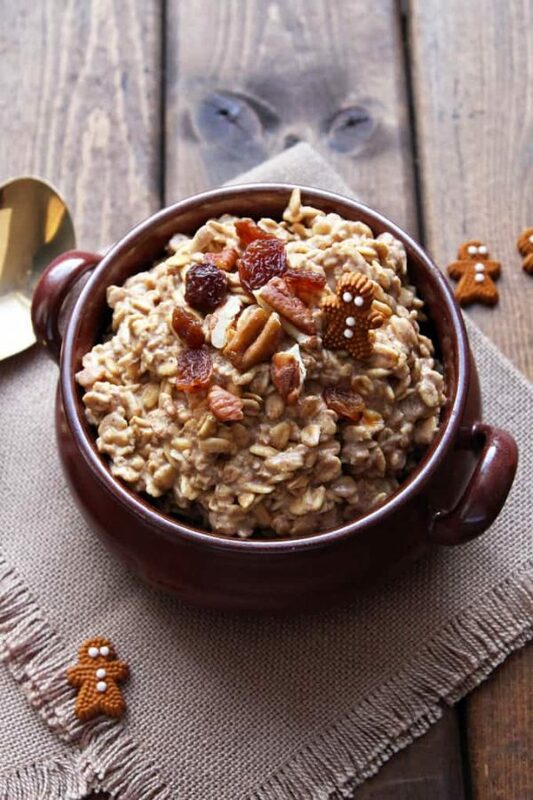 I am not trying to make you break tradition with these Gingerbread Overnight Oats. But they are, and I must admit, a great make-ahead breakfast option. This is especially useful in case you are not spending Christmas morning with family to share a pan of sweet rolls with. Or for Boxing Day, when you feel like a little healthier breakfast after feasting the day before. For those of you who don’t know, Boxing Day is the day after Christmas. It goes all the way back to the medevial times when people of service, i.e. servants, were given boxed up presents to take home on their day off and open and share with their families. You can actually go ahead and prepare this overnight gingerbread oatmeal right now to eat any morning in the next 5 days or so. The recipe below is written for 1 serving, but of course you can double, triple, quadruple… it as needed. Happy Peaceful and Present Holidays! I wish you all a very Merry Christmas! Hopefully, it can be a quiet time spent reflecting and making memories with loved ones. TELUS has a great little “Holiday Mode” video series on YouTube (LOVE the Foodie one), encouraging all of us to unplug, put aside our smart phones and actually be there with our families. I know, I’ll be trying…hard! For more healthy gingerbread flavor, also check out my healthy Gingerbread Cookies HERE! 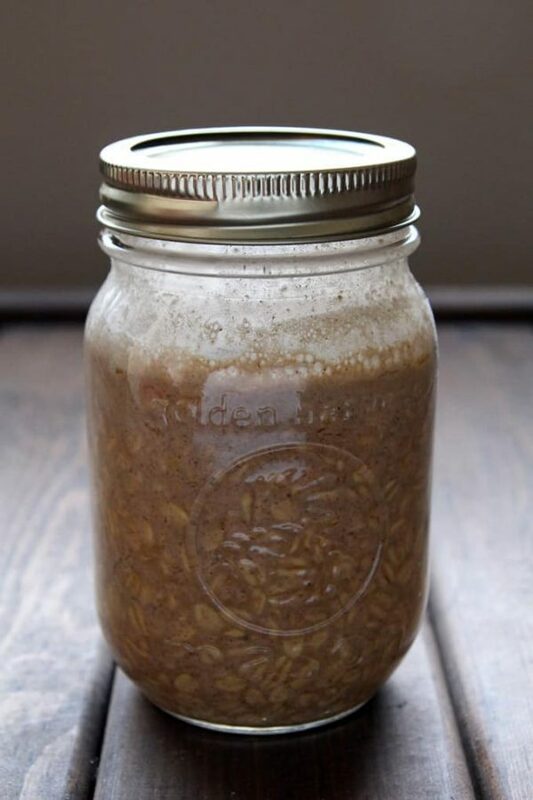 Place oats, milk, molasses , sugar, gingerbread spice and salt in a container with a tight fitting lid (like a mason jar). Shake to combine. Place container in the fridge overnight. Heat overnight oats in the morning, adding milk as needed (if desired). Taste and add more sweetener or spice to taste. Sprinkle with toppings. This sounds really good. 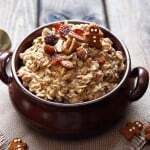 I love oats and I think I’m going to whip this up tonight for the morning! I do love overnight oats. Never tried a gingerbread flavored version before though.. I can imagine it tastes delicious! A recipe I need to try! Do try it! Even after the holidays the flavor is a nice reminder of Christmas. We have a quiet Christmas eve too, but will spend a day with my extended family tomorrow. Your overnight oats looks very nutritious and tasty, Regina. I am actually looking forward to a quiet Christmas 🙂 Happy Holidays to you too Angie!